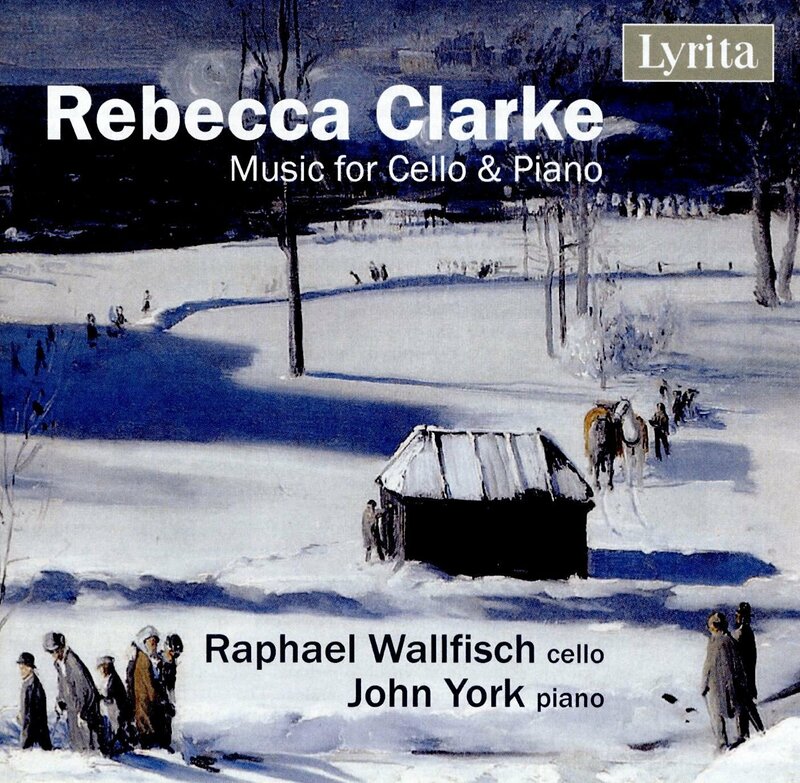 Rebecca Clarke is best known for her viola sonata but on the new disc from Lyrita, cellist Raphael Wallfisch and pianist John York give us slightly different view of the composer, performing Clarke's Sonata for Cello and Piano, which is the composer's own arrangement of the viola sonata, plus the slightly later Rhapsody for Cello and Piano, along with smaller works and John York's own Dialogue with Rebecca Clarke. Clarke is one of the great what-ifs of music. One of Charles Villiers Stanford's first female pupils, and one of the first professional women orchestral players, her submission of the Sonata for Viola and Piano to the 1919 Berkshire (USA) Chamber Music Prize sponsored by Elizabeth Sprague Coolidge almost achieved first prize except the judges could not believe the music could have been written by a woman. Her trio, with cellist May Mukle and pianist Myra Hess, was highly successful, yet she wrote only sparingly and effectively stopped when she got married in 1944. She suffered from a chronic form of depression and the lack of encouragement or even discouragement which she received for her work also made her reluctant to compose. The Rhapsody for Cello and Piano was written in 1923 and was a commission from Elizabeth Sprague Coolidge. The first movement opens with a rhapsodic slow introduction which grows from nothing, before leading into a big boned Allegro. This is complex music, romantic yet tough. The Adagio e molto calmato continues the mood, it is lyrical yet dark with a passionate intensity. The Allegro ritmico is lively and highly rhythmic, yet continues the powerful rhapsodic feel of the earlier movements. The final movement is at first, almost a continuation of the previous one, but it subsides into something rather thoughtful and then dies away to nothing. This is robust music, each movement is a highly varied sequence of textures and structures, but within the overall rhapsodic idea. It strongly and commandingly played by Wallfisch and York. I'll Bid My Heart Be Still is a short piece written originally in 1944 as a gift for her future husband, and based on a Scottish folksong. It is more English pastoral in style, an occasional piece with a lovely lyric tune. The Sonata for Cello and Piano, transforming the viola sonata, was made with the collaboration of cellist May Mukle, with whom Clarke played. The transcription is surprisingly successful, especially when played with the vibrancy that Wallfisch gives it. After an eye-catching opening gesture, the Impetuoso first movement really lives up to its marking, with a passionate flowing performance from Wallfisch. The Vivace second movement is characterful and vivacious with some perky moments, whilst the Adagio third movement is elegantly elegiac. Wallfisch brings out a lovely singing tone here, making the movement vibrantly intense and both performers give the piece a lovely freedom. The concluding Allegro is vivid and fast, yet still big boned and dramatic. Clarke's Passacaglia on an Old English Tune is an elegiac piece with a consciously period feel to the harmony. This is followed by John York's Dialogue with Rebecca Clarke which provides an immediate change of mood and style. It is a free fantasia on themes by Clarke woven into York's own language. Finally the Epilogue Lento, a rather restrained and lyrical piece. 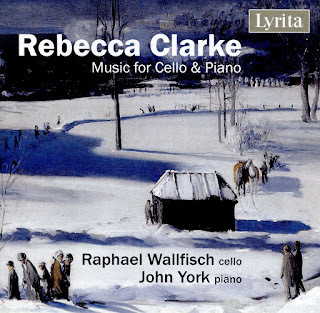 This is an important disc as it gives us a view of a slightly different Rebecca Clarke, and the Rhapsody for Cello and Piano is an important work, perhaps one of Clarke's greatest pieces and here it receives a strongly passionate performance from Wallfisch and York, complementing a striking account of the sonata which shows us a different side to the more familiar piece. A highly recommended recording.